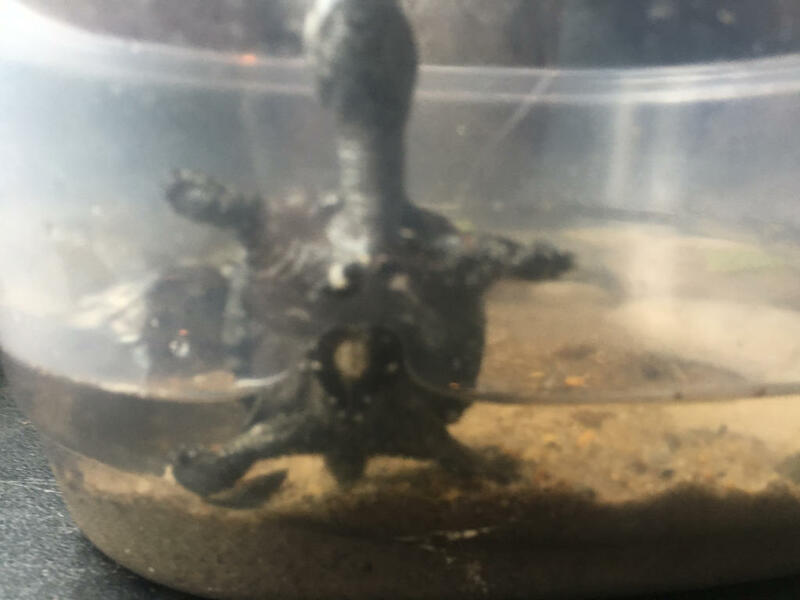 So I recently began caring for a baby snapping turtle, and have attempted to get the little fella to eat their greens, however, this little rebel has instead ignored the lettuce, which I have grown myself with no pesticides or whatnot, and has even swam around with the leaves on his head like some fancy hat. Any advice? Hatchlings tend to be more carnivores, so would stick with the mixed diet. Try some aquatic plants or a veggie clip. No pic of the fancy hat ? 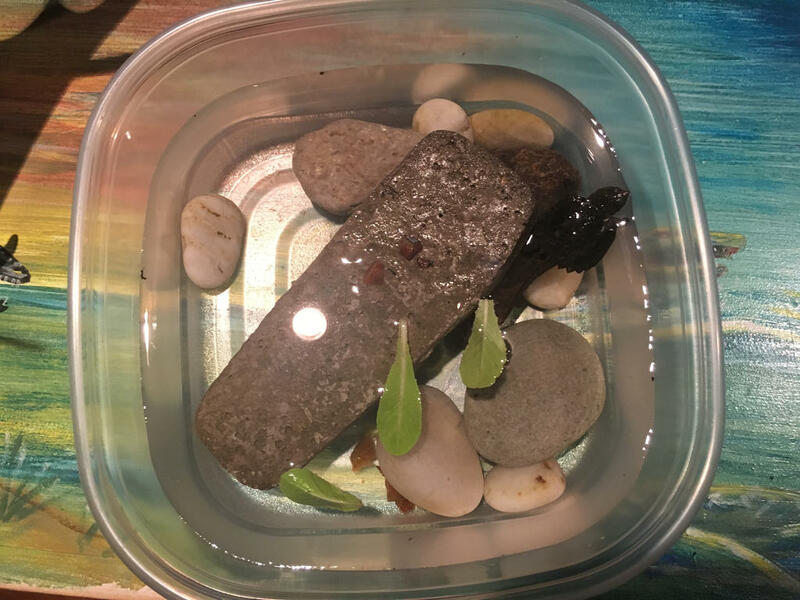 I found the little fella out in the backyard on a stone path, my house is a good 2 hours away from any lakes or rivers, so I'm at a loss at where the little fella came from. Right now he's in a large plastic pan, until I can get a larger tank, he was a bit panicky at first but has slowly become accustomed and has done about 30 laps around the pan. Could it be that he's just too curious to eat at the moment? If you plan on keeping it, don't forget that snapping turtles do well in deep water, contrary to popular belief. Don't be scared to give it space when it grows. They just don't swim a lot because they are ambush predators. But I would check the lakes/rivers in your area to see if there are turtles there. It's not uncommon for turtles to be found so far away from lakes and rivers. Doesn't swim a lot? That sentence surprised me , this little guy does like 30 laps every ten or fifteen minutes, however he refuses his greens. For a snapping turtle, he sure doesn't bite, whenever i think I'm too close, instead of biting he just tucks in and flees, grabbing my finger with his claws sometimes. At night he comes onto his brick to nap, then in the morning he's back to his laps, his food still untouched, this will be his second day of not eating since finding him. By the way this is his apparent use for lettuce, I sometimes wonder if his baby mind knows it's food. I was talking about adult snap :3 A lot of people tend to put them in tanks with very shallow water because they walk around at the bottom and they think their turtle will drown. Is he not eating anything or is he just refusing veggies ? If he eats his protein then try to rub some fish/fish stock with the greens and wiggle it around. I haven't tried fish yet, but I tried small insects and he simply ignores those too, I saw an unfortunate fly that got stuck in the water, the turtle, now referred to as Flynn, simply ignored it. 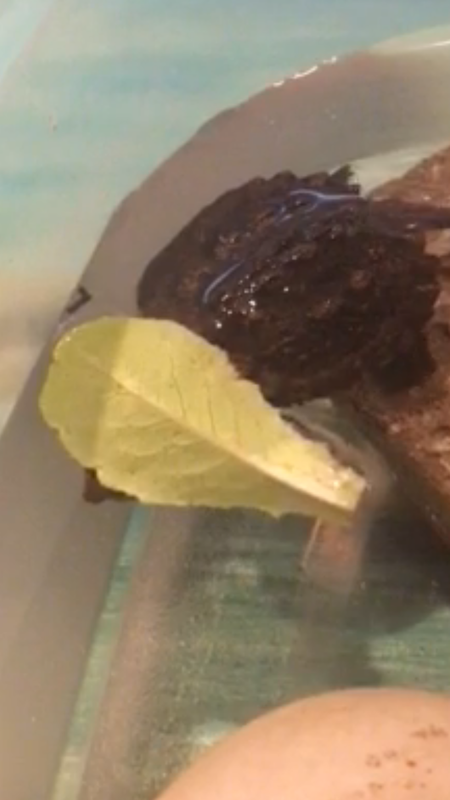 I left some basil and lettuce leaves floating this time, my brother noticed he has a yellow spot on his stomach, around the center of his shell. This was noticed when he was trying to climb over the wall of the tub and fell on his back into the water, could this be his yolk by any chance? It could be, do you have a pic of it? Does it protrude? We saw it by chance when he fell backwards trying to climb out, if I were to try and pick him up to get a picture I believe he will do what he usually does and try to push my away with his feet, the little guy hates being handled, but he tends to fall over now and then , so I will keep a lookout when I see him balancing on his tail like usual. That could explain why he doesn't care about anything. Continue to propose some food regardless, cause we can't know for sure without a pic. Even after the yolk disappear some hatchlings won't eat for days. Would this be the yolk? Today I bought some reptomin pellets and gourmet pet shrimp in a can, which should I use to tempt him first? It does look like yolk. Don't worry too much about him not eating, even if it takes up to a week, but keep offering food so you know when he is ready to eat. Try the pellets since it's more balanced than the shrimps, it would be better for him in the long run lol. If he refuses the pellets try to rub the shrimp so it has the same smell. I did this for my hatchlings and once they understood the pellets were food they never stopped eating. Turtles won't starve themselves and will eat when they feel they need to. Turns out there are snapper nests scattered around town due to the Assabet River running through the downtown area, upon further research apparently there are also endangered turtles with yellow necks that should be hatching around this time. Anyways, thanks for the advice!